The main suspect in the murder of businesswoman Monica Kimani broke down in court on Monday as his mother embraced him minutes before taking plea. Mr Joseph Irungu, alias Jowie, shed tears as his mother held him in a tight embrace after walking into the courtroom a few minutes before the session began. 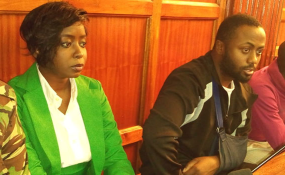 His fiancée, Ms Maribe, on the other hand, had her father Mr Mwangi and mother as well as friend Dennis Itumbi for support. The two suspects denied killing Ms Kimani at Lamuria Apartments in Kilimani on September 19. Wearing a green skirt suit and white blouse, Ms Maribe said she understood the charge when asked by Justice Jessie Lesiit. Prosecutors, led by Ms Catherine Mwaniki, said they will oppose their release on bail as did a lawyer representing Ms Kimani's family. Ms Mwaniki said some of the witnesses have to be placed under witness protection and they were yet to complete investigations. The duo will be given a date for a hearing of their bail application on Wednesday, October 17.